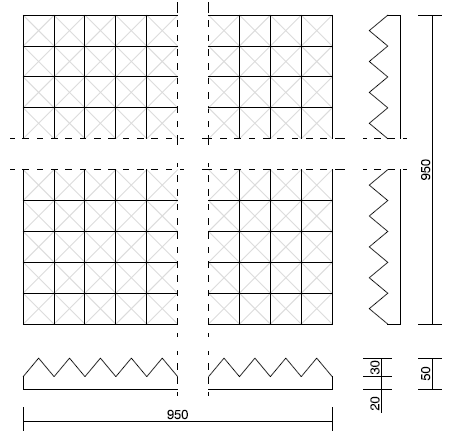 Pyramid acoustic foam presented in sheets of 950 x 950mm (thickness of 50mm). Price per pack of 8 units covering up to 7.22m2. FR28 foam, in charcoal grey or garnet, self-extinguishing (UNE 53127). JAFRA panels are acoustic absorbers with a classic design. They are used in many music studios around the world. They are made of high quality self-extinguishing acoustic foam, with an optimal density and controlled porosity to obtain a high performance in sound absorption. The studied balance of the pyramid proportions, in combination with the high efficiency foam, results in a good all-purpose sound absorber and extremely versatile panels. The acoustic panels provide excellent absorption at medium and high frequency; due to the pyramid-shaped profile which increases the absorptive surface of the foam, the effective acoustic capacity per m2 is enhanced. Acoustic treatment for rooms which require an economical and efficient solution to reduce and control reverberation time, echo or resonant modes, improving acoustic comfort and performance.